At the presumed time of the castle’s creation, shortly after 1066, Guildford was the only town in Surrey. 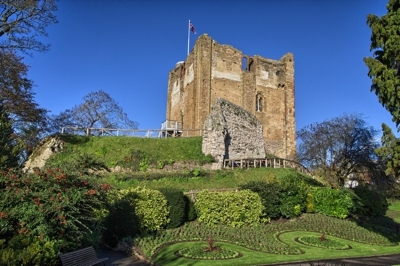 Guildford was also a key staging point on the main route from London to the south coast so it was the obvious place in which to build a castle designed to remind the local Saxons that they were now under Norman control. It almost certainly started out as a wooden tower, but by the beginning of the 12th century there were chalk walls instead of wood. By the late 1130’s the present castle was taking shape in the form of a classical Normal great tower, build of Bargate stone quarried in Godalming. The tower was divided into two floors, featuring latrines, a chapel, and a Great Hall, with a lead roof and exterior walls coated in plaster and whitewash. By the end of the 13th century the castle had been so improved by Henry III that it merited the title of ‘palace’. A succession of kings, queens and barons continued to occupy the castle until if fell into disuse in the late 14th century, whereupon it commenced a less glamorous career as a county goal, private residence and as a cockpit. Finally, in 1886 it came into the possession of Guildford Corporation. The Great Tower was restored and the surrounding land was laid out as pleasure gardens. More recently, in 2003, a new roof and floor were re-instated and a permanent visitor centre was established on the first floor. Important Note: There are access issues for disabled guests due to narrow staircases and the steep mount on which the castle was built. The grounds include extensive flower beds, fish ponds, a bowling green and several memorials and statues, and , in summer, an open air theatre. The paths are well surfaced and plenty of park benches are provided. The atmosphere is quiet and tranquil. Access to the castle is via steep metal steps, the entrance door being some distance above ground level. Once entered, the first floor includes a visitor centre and exhibits including a model depicting how the castle would have looked in the 13th century, and interpretation panels charting the castle’s history from its beginnings to the present day. Visitors willing to climb to the castle roof can obtain panoramic views across Guildford and the surrounding countryside from well-fenced visitor platform. Upon descending from the roof, visitors may wish to take a look at the small gift shop located on the ground floor where the usual merchandise such as guidebooks and postcards may be purchased. Open all year, from 8am until dusk. Admission is free.